There is a 13-year-old kid inside of 63-year-old Gary Hines – a kid who pops up smiling and gleeful when Hines recalls his days of playing pond hockey so many years ago in his hometown, Little Falls. Hines, a longtime hockey coach for Sartell and Sauk Rapids, is the owner of Hockey Zone Minnesota in Waite Park. 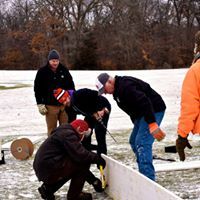 He is also the organizer of the Granite City Pond Hockey Championship Tournament that will take place Feb. 1-3 at Blackberry Ridge Golf Club in Sartell. Hines happily admits that hockey brings out the “kid” in him. As a boy, he and his neighbors loved nothing better than to play outside in the winter months, especially pond hockey. When talking about those days, Hines bubbles over with gleeful nostalgia, as if his long-ago youth is just a breath away. And he giggles like a kid when he recalls how his father years ago would take the kids out riding deep into the country in his 1953 Ford. The father would tie a rope onto the back of the car and to the front of a big toboggan, and the kids would pile on and off they’d go, laughing and shouting with joy, along the sleek, snowy roads. Hines wants, more than anything, for kids nowadays to experience the same kinds of winter pleasures. Hines said he worries about how so many children are tuning into their iPhones and other electronic gizmos but tuning out from in-person communication. Hines has a hope and a vision that it can happen, if only parents and children are exposed to a chance to have fun – pond hockey, ice skating, winter walks, sleigh rides, snowshoeing, cross-country skiing and more. Recently, Hines’s business donated 40 pairs of skates to Blackberry Ridge so people who don’t happen to own skates can visit, put on skates and zip around an outdoor rink or cautiously, wobbly, learn to skate for the first time. 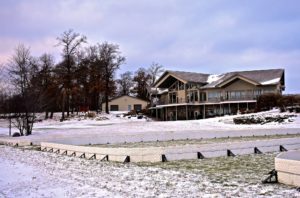 In early January, three outdoor ice rinks were constructed and flooded just outside the Blackberry Ridge clubhouse. Hines and many others are hoping the winter activities will catch on and grow, joining friends, families and new acquaintances together for social fun – not to mention healthy exercise. Many years ago in Sartell, there was a popular festival called “Winter Haven” in the city’s Watab Park area that attracted people from throughout central Minnesota and even as far away as the Twin Cities. Hines is hoping that kind of winter fun can become a renewed tradition at Blackberry Ridge and other winter-activity venues in the area. Hines said throughout his 20 years of coaching hockey, he constantly was happy and inspired every time he’d see the smiles on the faces of kids who were having so much fun. In 2011, Hines and others started the nonprofit Minnesota Youth Foundation, and in 2012 the organization started pond hockey on rinks upon Lake George near downtown St. Cloud. Blackberry Ridge will be a much better venue, he said, because its location is rural, with a good wintry-landscape feel. Each team, various categories for youth and adult, will be limited to six people, with each game on the 50- by 100-foot rinks not lasting very long – 15 minutes or so. There will be a big warming tent set up with plywood floor, with food and beverages and some wood fires burning near the rink. Hines and Blackberry Ridge staff are continuing to work on more family-fun winter events, including a pond hockey tournament for military veterans and perhaps a program or two in conjunction with the Hockey Hall of Fame in Eveleth. To find out more about ongoing winter activities at Blackberry Ridge, call 320-257-4653. In December, workers constructed the parameters for rinks at Blackberry Ridge Golf Club, getting ready to freeze water for outdoor ice sheets on several rinks. Ice rinks have opened on the grounds of Blackberry Ridge Golf Club in Sartell. The rinks will be the venues for all kinds of outdoor winter fun, including a pond-hockey tournament Feb. 1-3.